Experience the bliss of yoga in aerial silks, here in Bobcaygeon overlooking Pigeon Lake. This class is fun, challenging, relaxing and perfect for beginners to aerial yoga. We will explore fundamentals including zero compression inversions, suspended stretching and soaring off the ground! You will learn the ins and outs of the yoga silk, the principles and techniques of aerial yoga. This class is recommended for first timers, to discover the power, excitement and pure joy of inversions and flying in open space while building knowledge of foundational movements essential to progression in the practice. Next Session Start Date: Monday - Apr 22 - June 10 at 7:30pm ~ 8 Week Session. $150+HST/8 week session. I love this class. It has been super fun and a joy to teach. As we move through the series be prepared to discover your ananda (bliss) in levitating meditations. 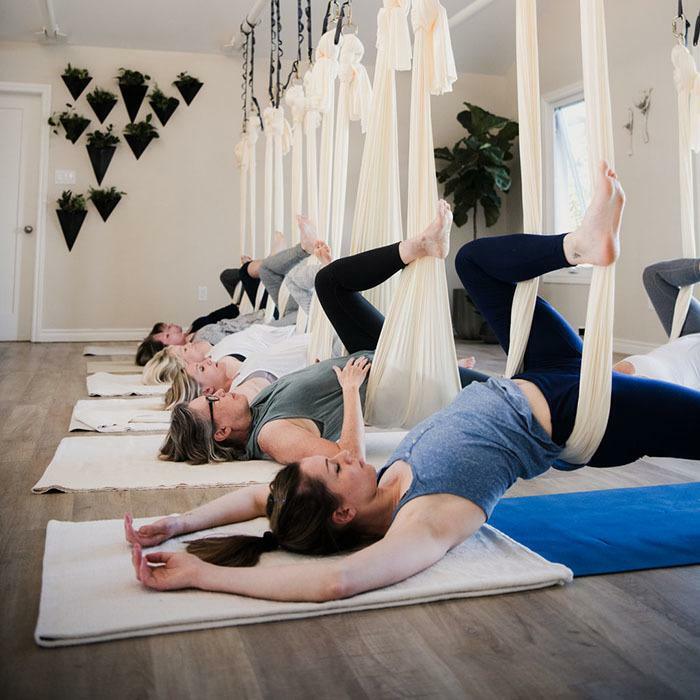 Gain strength in your yoga practice as you challenge yourself to attempt more difficult positions with the assistance of the aerial silk hammocks. Explore the evolution of yoga into three dimensional space through this mind/body/spirit class where you will learn to execute challenging flying asanas and vinyasa variations. Each class will include a cool down. Quieting the mind, while floating the body through a series of gentle gyro kinetic motions, this technique deeply opens the entire spine, hips, and connective tissues of the body. 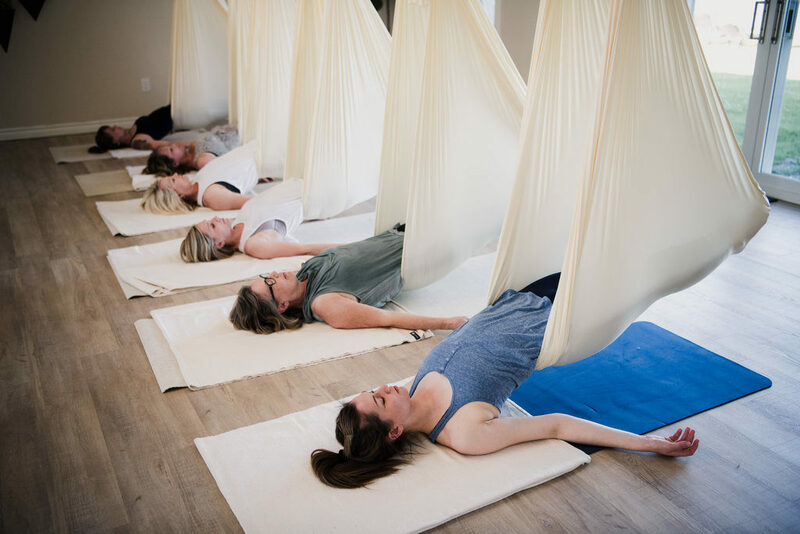 This class utilizes the Hammock to gently restore and repair the muscular, structural and nervous systems of the body. Each class will end with a "cocoon" floating savasana. Note: This style of class is a great workout for many different ages and body types. It's great for people who have an open mind!